"I guess I always felt even if the world came to an end, McDonald's would still be open." 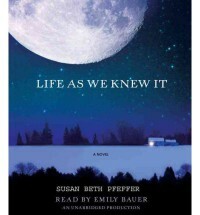 --Miranda, Life as we knew it by Susan Beth Pfeffer. Exactly what any child/teenager would say if the apocalypse was upon us. Watching Miranda grow from your typical 16 year old teenager to a conscientious and thoughtful young girl was refreshing and believable; at least when they are put in this kind of situation. The emphasis on family and sticking by your family is refreshing. This is what I liked about the book. Now, for the stuff I didn't like...This is probably a 4 to 5 star read for someone who is young, because there is no violence in this, but for me as an adult it's just not believable. In the beginning when they make there run for all the supplies they can get, I kept thinking they should get a gun, at least for protection. Because, you know someone is going to come along and try to take their food by force. Secondly, and this is the reason I went from a 4 star rating to 3.5 star rating is...the book is rather uneventful and boring.